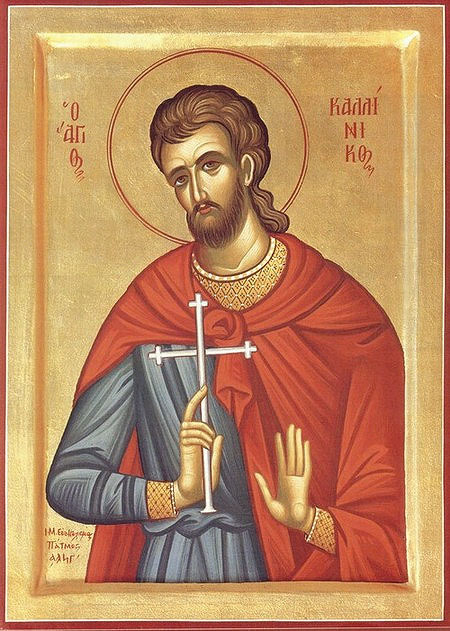 Today is the feast of St. Callinicus the Martyr of Gangra in Asia Minor. 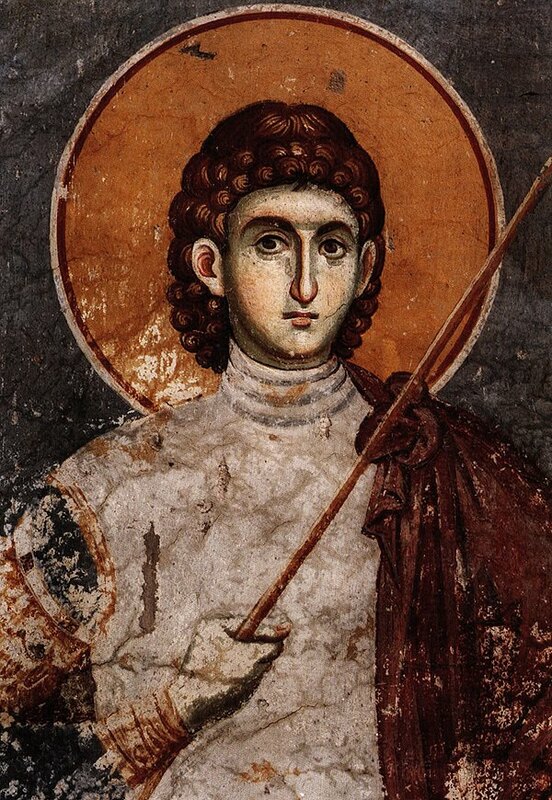 He was born to a Christian family in Cilicia (southern part of modern-day Turkey). In the early part of the 4th century, he became a wandering preacher, bringing many to Christ. Upon coming into the Galatian city of Ancyra (central part of modern-day Turkey) he was arrested by Governor Sacerdonus, a fierce prosecutor of Christians. After resolutely refusing to denounce Christ and offer sacrifice to the idols despite being beaten with ox thongs and having his flesh torn with iron hooks, shoes with nails directed inwards were placed on his feet and he was paraded through the streets to the city of Ganga. The soldiers who were escorting him ran short of water, and asked that the saint pray to his God for relief. A spring welled up out of the ground to quench their thirst. Once in Gangra, the saint was burned at the stake. Despite being given the crown of martyrdom, his body remained incorrupt. These magical shoes appear to be torture devices made of metal with spikes affixed to the soles of the shoes designed to penetrate the foot of the wearer; however, they give off a magical aura if detected for. Should anyone be brave enough to put these shoes on, they suffer 1d6 hp of damage, cannot remove to shoes until death (even with a Remove Curse spell) and can only surprise on a roll of ‘1’ instead of 1-2 on a d6. The wearer of these shoes cannot die of thirst, is immune to all normal fire, takes half damage from magical fire and may make a saving throw to reduce any damage from magical fire to 0. Recently, Rogue One: A Star Wars Story appeared on Netflix. To be honest, after enduring Star Wars VII, I was not particularly interested in this movie despite all the rave reviews. Unfortunately, I couldn’t get to sleep the other day and decided to see if Disney’s take on what has already been covered in Star Wars: The Original Radio Drama was boring enough to put me to sleep. I made it to about the 40-minute mark. Here is the thing: all of us already know this story. We all knew going into the movie that rebel agents would steal the Death Star plans and get killed delivering this vital information to Princess Leia. 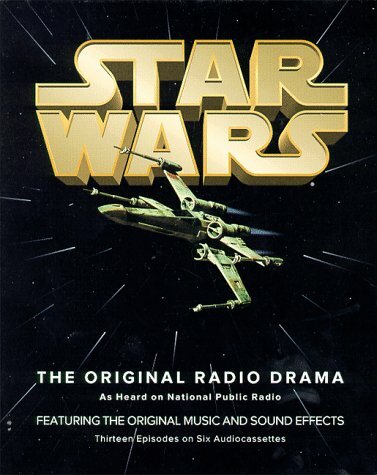 If this last bit came as a surprise, evidently the pitched battle at the beginning of A New Hope was not a big enough clue, or, as I mentioned above, you haven’t listened to the Radio Drama (and you really should). What motivates The Agent to be willing to die? Is The Rebellion/The Empire worth dying for? Answering these questions can make for a gripping story despite the fact that we know the plot. 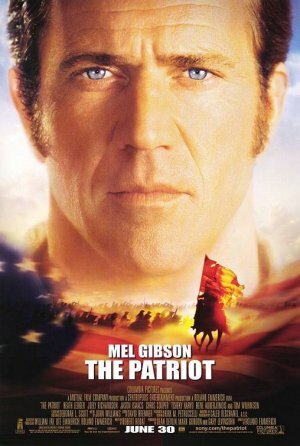 For example: The Patriot has a basic plot that we all know: the American Revolution. The movie, however, was not about the American Revolution. It was about how Mel Gibson’s character, Benjamin Martin, went from being a guilt-ridden combat veteran who wanted nothing to do with the war to becoming a Patriot. As a post-Christian movie, Rogue One failed miserably on this front. While they did provide us with a bunch of cool characters, not one of them had any real depth and the movie never really bothered to give us an arc to understand why these people were willing to die for the Rebellion. Further, the portrayal of the other two main characters (The Rebellion and The Empire) was fraught through with relativism. The Rebellion was portrayed as a fractured, schizophrenic movement that really didn’t know what it wanted to be, all the while doing whatever it took to survive including murdering its own and committing acts of terrorism. The assumption here is that simply taking on the mantel “The Rebellion” automatically makes these people the good guys; however, being rebels does not a good character make. For example, the Bolshevik Revolution executed around 1000 political prisoners a month into the early 1920s. The Empire was portrayed as an entity that wanted to bring peace to the galaxy at all cost, up to and including the use of a super weapon; however, having and using a super weapon does not an evil character make. The U.S. is the only country to ever actually use a nuclear weapon in war. The U.S. did so to end WWII and it is arguable that not only did its use save lives, but that the cause for which they used that weapon is one of the greatest countries ever to exist (warts and all). So, 40 minutes into the movie I didn’t understand why the Rebellion was so important to save because they were portrayed as not being much better than the Empire and I certainly didn’t understand why all these cool characters were so willing to run off and die to save it. Back when Disney bought Star Wars from George Lucas I was hopeful that new life would be pumped into the franchise after the bitter disappointment of Episodes I-III. Unfortunately, Disney has proven once again why I trust Hollywood about as far as I can throw a bantha. All they have done is produce movies that make Episodes I-III look good in comparison. After all, no matter how badly they were done, at least George Lucas attempted to answer the question as to why Anakin Skywalker became Darth Vader. From the get go I need to provide some links, because when I do thought experiments like Under Portown I like to heavily lean on random tables. The tables that I used here were provided by one of my all-time favorite tomes produced in this Golden Age of RPGs, The Tome of Adventure Design published by Frog God Games as well as the excellent Holmes Ref 2.0 produced by Zenopus Archives. In order to make sense of this, I decided to root these three factions in the implied ancient civilization/classical civilization/current civilization pre-history of Holmes Basic. In other words, one of these groups represents the degenerate remnants of the ancient civilization, one represents either an actual remnant or degenerate remnant of the classical civilization and the last is simply a threat that exists to the current civilization. 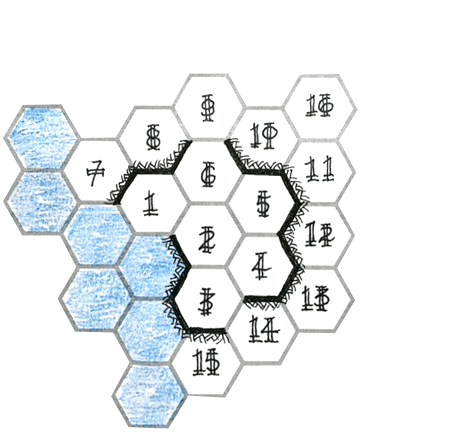 Given that there is a place on Cook’s map of the Known World called “Wereskalot” and it is in relative close proximity to where I place Portown in the Known World, it makes sense that the current threat could easily be represented by the Wererats. I was actually thrilled that troglodytes came up, because I think they are one of those under-utilized monsters that can have a lot of interesting background noise around them. Normally, I’d be inclined to use them as a stand-in for ancients given their underground habitat, but in this case I am more inclined to use them as degenerates from the classical civilization due to the fact that Holmes seems to indicate that this civilization was one that rose up to free dragons, giants etc. from the ancients. As remnants of the classical civilization, they are exploring Under Portown to find ancient magics to help bring Portown to its knees. To boot, Ghouls seem to be a great way to keep the ancient civilization ticking over time given that undeath can be seen as a way of cheating death. This could be especially creepy if ghouls are understood to be intelligent rather than the best D&D representation of the modern zombie as depicted in a George Romero film (may he rest in peace). Given that ghasts do not appear in either Holmes or Cook, I will give myself the creative freedom to bestow that ghastly intelligence upon these ghouls. Lord Fenclaro the Quiet: the current resident of the Lord’s Mense and de facto leader of Portown. He is not seen much in public. Most of his dealings are behind closed doors and there is a rumor that much of his time is used researching some strange magical artifact left to him by his grandfather. Drenaboten the Peculiar: this foppish merchant is actually an agent of the Black Eagle Barony. His primary role is to launder money through legitimate business ventures gained by the Barony’s illegitimate support of the slave trade, the Thieves’ Guild and various bandits and pirates. Drebb the Daring: this merchant is better known for his gambling habits and his penchant for insuring some of the more reckless ventures of ship captains going north (which somehow succeed more often than not). He is actually an agent of the Grand Duchy. While he uses his gambling habits as a cover to root out information on the Barony’s unsavory activities, he has no qualms about starting rumors himself to further tarnish the reputation of the Baron. Haque the Foul: this shadowy persona is more of a title than a person. It is given to the current leader of the Thieves’ Guild. Recently, that position has been taken over by a wererat with the goal of furthering the reputation of Wereskalot as a major power player in the region. He is also coordinating with the wererats currently exploring/controlling Under Portown. Endbruteth the Collector: as the head of the University of Portown, he is considered too young to be the curmudgeon he appears to be. The moniker “the Collector” is an inside joke with more than one meaning. He does collect oddities that are oft considered junk by others and he has enough charisma to recruit some of the best mages and scholars from around the world. The real reason for moniker, however, is that he has led the Wizard’s Guild on a secret purge that hunts down and kills anyone or any group that gets too interested in discovering the secrets of Under Portown. Tengahn the Mutable: this gaunt but otherwise nondescript merchant is prone to support whichever faction will pay him the most. In truth, he is a ghoul who seeks simply to wreck as much havoc and chaos upon the living that he can, all the while hunting for the weak and vulnerable to have for dinner (literally) with his fellow ghouls. Today is the Feast of St. Vladimir of Kiev who is given the moniker Equal-to-the-Apostles, which is given to those saints that aren’t normally seen as apostles (such as monarchs and women), but whose life declared the Gospel of Christ in such a way that led many to baptism. 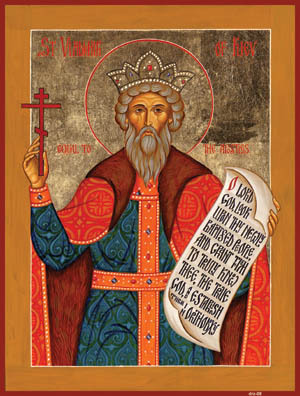 In the case of St. Vladimir, the Rus followed their monarch to Christianity. Born Volodimir and a pagan, St. Vladimir was not unfamiliar with Christianity as the grandson of St. Olga. Nevertheless, there are many histories of how brutal Volodimir was. For nine years he reigned in Kiev before he got involved in a civil war within the Byzantine Empire. He came out of that experience as a baptized Christian, with a marriage to the Emperor’s Daughter Anna and with the title Tsar (meaning Caesar). Nonetheless, he diligently spread the Christian faith and ordered idols (which he had made of the pagan gods he once worshipped) scourged, dragged through the city and thrown into the Dnieper River. The history of the Russian people as Orthodox Christians in many ways begins with St. Vladimir. He died from illness in A.D. 1015. One of the primary gods that Volodimir famously made an idol of silver and gold for (one which he shortly thereafter destroyed) depicted what could crudely be described as the Slavic version of Thor — Perun. As the highest god in the Slavic pantheon, Perun was understood to be the god of thunder and lightening. Unlike Thor, however, he did not have a slavic version of Mjolnir. Rather, he had a bow with which he shot “thunderbolt stones” which could be found buried in the earth. Weapons and devices made of these thunderbolt stones were believed to provide protection from various calamities such as bad luck, evil magic, disease and (of course) lightening. Accepting the premise that Perun was, in fact, just an idol made by human beings to explain natural phenomena, these “thunderbolt stones” must have a different origin. Indeed, according to modern science, they are fulgurites and belemnites. In context of a FRPG, this opens up the door to some good old fashioned science fiction/fantasy mash-up world-building. In ancient times, for example, there could have been a massive war between aliens and what are popularly known as “the ancients.” Artifacts from this era litter the land. One could even tie in the existence of magic to this event: thunderbolt stones are the source of all arcane magic in the world. This, of course, leads to the possibility of introducing things like “Thunderbolt Guns” into the game. As I have mused in the past, D&D doesn’t do firearms very well. This is because its combat premise (better armor makes you harder “to hit”) does not reflect what happened historically once firearms are introduced. The logic of D&D would assume that plate mail would still be a viable option for soldiers on the battlefield because they wouldn’t get hit as often with bullets as someone who was simply wearing combat fatigues. I have yet to see any house rule that allows for guns that completely satisfies me. I did play test the Leather = DR1, Chain = DR2 and Plate = DR3 where guns get to ignore the DR. It just didn’t flow like I hoped it would. The implied tactical choice wasn’t as interesting as I hoped and in the end the extra mechanic just slowed things down enough that I am not really interested in playing with that house rule any more. Thus, I am still interested to see if there is a simple system that can help introduce guns into D&D that can easily emulate the tactical realities of the 18th century when armor had mostly disappeared from the battlefield because firearms happened. The idea of Thunderbolt Stones being the source of arcane magic in a FRPG world, the old musings of Aos at The Metal Earth as well as my recent delving into the world of Swords & Wizardry Light got me thinking on a completely different tangent: why not treat firearms like fireballs? Armor in all its forms is ineffectual against guns. Thus, on average, someone using a gun only needs to hit an AC 9 to hit your average guy clad in plate mail; however, just like when that same plate mail-clad guy gets hit with a fireball or dragon’s breath or a charm person spell, he gets a saving throw. Depending upon the type, range and caliber of the weapon this save could be for half-damage or no damage at all. For example, due to the inaccuracy of muzzle-loaded firearms, anything beyond point blank range might be a save for no damage, but anything close-up would at least do half. I think this ticks all the boxes for me: it doesn’t radically mess with the D&D combat system, it uses extant mechanics everyone is familiar with, it doesn’t over power guns and yet emulates why on a field full of guns no one bothers to wear any armor. I have spent some time with the local scholars, who all seem to agree that Portown was built over some kind of settlement originally built by what they call “the ancients.” There is, however, some disagreement as to how significant the settlement actually was. Most dismiss the idea that such an isolated area would be anything other than a minor colony. I was able to barter some more information from a man called Garudon. The other scholars like to refer to him as “the Younger,” possibly due to the existence of an older man of the same name; however, I have noticed that the hairy nature of the locals seems to increase with age and Garudon the Younger seems as able to grow a beard as I am. He seemed rather interested in stories from my homeland, and I was able to get out of him information about a pair of scholars that seem to have fallen out of favor. Evidently, there is one scholar, simply known as “the Albino” that insists than there are texts that suggest Portown was far more than just an ancient colony. This theory has no physical evidence, however, and, as “the Albino” shuns daylight and the outdoors, there doesn’t seem to be any interest in finding any physical evidence to corroborate that theory. I could also sense that there was more to this that simply a lack of evidence. When I pushed, Garudon seemed almost afraid. Finally, when he made sure that there could be no possible eavesdropper, he mentioned someone he called Bereth the Mad. One of the reasons “the Albino” cannot drum up any support for his theories is that one of the texts was written by the Bereth before he went mad. So, it seems that it is not just that physical evidence cannot be found, it is that there are those that do not want it found. Today is the Feast of Sts. Cosmas and Damian the Unmercenary Healers. These brothers were from a pious family in Rome and were physicians by trade. They became renowned for miraculously healing people through prayer. The brothers told the sick, “It is not by our own power that we treat you, but by the power of Christ, the true God. Believe in Him and be healed.” They accepted no payment for their treatments and so earned the title “Unmercenary Healers.” They were martyred the year A.D. 284, under the Emperors Carinus and Numerian. Interestingly, these are one of three pairs of Unmercenary Healers with these names celebrated in the Orthodox Church today. On November 1st we celebrate Cosmas and Damian from Asia Minor and on October 17 we celebrate Cosmas and Damian from Arabia. Some have speculated that not all of these saints had the names Cosmas and Damian in life, but became known as Cosmas and Damian because of the fame and piety associated with those names. It is also reminiscent of the superhero trope of the mantle most explicitly expressed (in my mind) by the Phantom: the Ghost Who Walks. The whole mystique of the Phantom is that he never dies and this illusion is accomplished by the mantle being passed down from generation to generation. Sts. Cosmas and Damian, however, suggest a different kind of mantle. 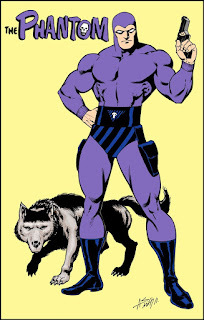 Whereas superheroes like the Phantom defend a place and/or fight injustice as vigilantes, Cosmas and Damian largely ignored the powers that be and simply healed those in need. Of course, this resulted in many believing in Christ which was perceived as a threat to Roman rule. In context of an FRPG, this suggests an interesting twist on the whole “my character got bit by a giant rat and needs a Cure Disease spell” experience. What if practicing divine magic were illegal or tightly controlled by the the powers that be or was otherwise restricted to the rich and powerful? In response there could be a mantle for various healers to pick up in order to protect their own identity and still be able to help those in need. Such a mantle could even eventually be picked up by a cleric PC. For an example of a campaign style where such a mantle could exist, check out this.